There’s some debate about who first used the 4-2-3-1 formation that became so popular across Europe in the 2000s. It probably started its development in the mid-90s, and some would point to Manchester United of 1994 as a forerunner, and perhaps Arsene Wenger’s Arsenal side and Real Madrid under John Toshack have claims to this award as well. But the difficulty in describing these shapes as 4-2-3-1s comes from the fact that they were all effectively converted 4-4-2s, with holding midfielders, advanced wingers and a forward who liked to drop off into space. They were formations that became 4-2-3-1 when play developed, whereas Rafael Benitez’s side genuinely lined up with four bands, and a clear ‘three’ behind a lone frontman. The key difference was in the player immediately behind the forward – whereas the aforementioned sides used Eric Cantona, Dennis Bergkamp and Raul respectively, Benitez used Pablo Aimar, a slender, enigmatic ‘next Maradona’ who was without question an attacking midfielder rather than a deep-lying forward. And therefore, there were five midfielders. The 2001/02 was, frankly, as boring a side as won a domestic league title in the whole decade. A return of just 51 goals scored in 38 games is a laughable total for a Championship-winning team (no other top 5 team scored less than 64) – but Valencia were incredibly well-organised, and masters of the 1-0 win. The key was the fact that Valencia effectively played three central midfielders at a time when the rest of Spain was only fielding two. They rarely lost possession, and when they did, they were quick to get nine men behind the ball. Goals were in short supply from around the team, but Mista (a player Benitez had brought through the Real Madrid youth team) had an excellent season, and always deserved more recognition than he received. Ruben Baraja and David Albelda were arguably the best midfield partnership of the decade – both intelligent passers and both positionally excellent in front of the back four – Baraja was probably the one who had more license to go forward and possessed a decent shot, but generally they left the attacking to the front four. The side changed very little in terms of personnel for their second league title in 2003/04, a season when they also won the UEFA Cup. 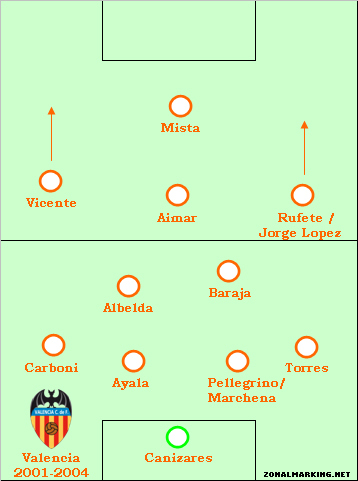 They did, however, demonstrate that the 4-2-3-1 was not merely a defensive shape, and credit must go to Benitez for the attacking shift - they conceded the same number of goals as they did in 01/02 (27) but managed to score twenty more goals, only one fewer than the league’s top scorers, Real Madrid. Mista became even better and Vicente added the goalscoring ability that was so clearly lacking when he first joined the club, and Valencia were without question the best side in Spain. Their run to the UEFA Cup final was less spectacular, and they won a poor final 2-0 against Marseille, effectively decided by one incident in the first half (Fabien Barthez bringing down Mista, being sent-off, and Vicente converting the resulting penalty). Mista added a second and that was that – both for the game and for Benitez’s time as manager. Cracking side, great formation, wonderful goal. Superb goal. Rufete was criminally underrated, one of my favourite wingers of the decade.